Sensore di corrente fino a 10mA. Viene alimentato a 12V e fornisce un'uscita analogica tra 0 e 5 volt direttamente proporzionale alla corrente misurata sui terminali. 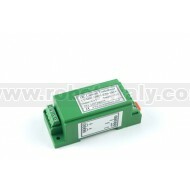 This DC Current sensor measures DC current, up to 10mA. Powered by an external 12VDC power supply, the DC Current Sensor provides a 0 to 5VDC analog signal that is linearly proportional to the current measured at the terminal blocks. The DC Current Sensor can easily be mounted using the screw holes, or on a 35mm wide DIN rail for quick installation. The terminal blocks accommodate conductors of up to AWG #16. In order to measure the current, the sensor has an internal 50 Ohm resistor. This will result in a slight voltage drop before the voltage gets to the device requiring the power. Consequently, the “leftover” voltage might not be high enough to power the device, especially if the power supply has a voltage close to the device’s minimum voltage requirements. As a point of comparison, using a 9V battery running through an LED with a forward voltage of 1.8V and a 1000 Ohm resistor, there is an approximate drop of 0.35V due to the 50 Ohm sensing resistor on the 10mA DC Current Sensor. 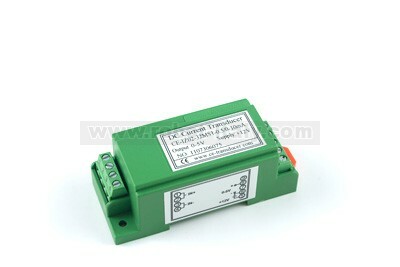 The maximum voltage drop is 0.5V, when the sensor is measuring 10mA. The output of this sensor is not clamped at 5V. If the current being measured exceeds the rated input current, more than 5V will appear at the output signal. This can damage the Phidget Board (or any other ADC) that it is attached to if the output signal exceeds 5V for an extended period of time. In order to use one of these power supplies with this sensor, you must cut the small plug from the end of the power supply and connect the wires directly into the sensor. You can also use a 3031 – Female Pigtail. 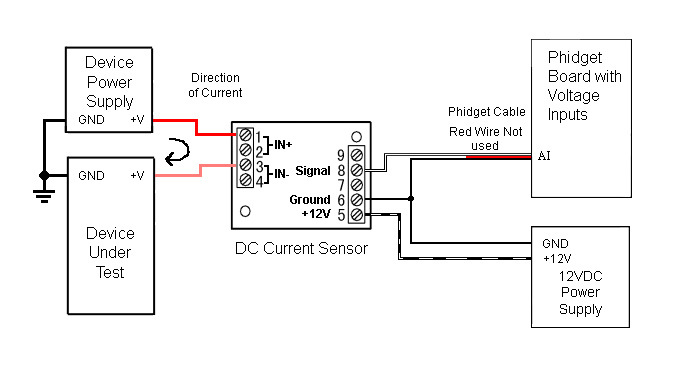 You can use the 3002 - Sensor Cable 60cm or the 3004 - Sensor Cable 350cm to connect the DC Current Sensor to your Phidget. Just snip off the connector from one end of the sensor cable and connect the white wire to the terminal marked with an 8, and the black wire to the terminal marked with a 6. The red wire is not used. You can also use a 3031 – Female Pigtail. This is how you connect the 3511 to a Phidget Board that does not have 12V power supply, such as the 1018 or 1203, using a Sensor Cable. Connect the Power Supply +12V wire (the wire with the white line) to the Current Sensor terminal 5 (+12V). Connect the Power supply Ground wire and the Analog Sensor Cable Black wire to the Current Sensor terminal 6 (-). Connect the sensor cable white wire to the Current Sensor terminal 8 (+). Connect the positive wire of the device’s power supply to the Current Sensor terminal marked 1 (IN+). Connect a wire from the input voltage of the device under test to the Current Sensor terminal 3 (IN-). For boards that have power input, such as the 1019 or the 1072, if the supplied power is 12V, then the + terminal block on the Phidget Board can be connected to the voltage sensor terminal 5 (+12V), and the G terminal block on the Phidget Board can be connected to the sensor terminal 6 (-).